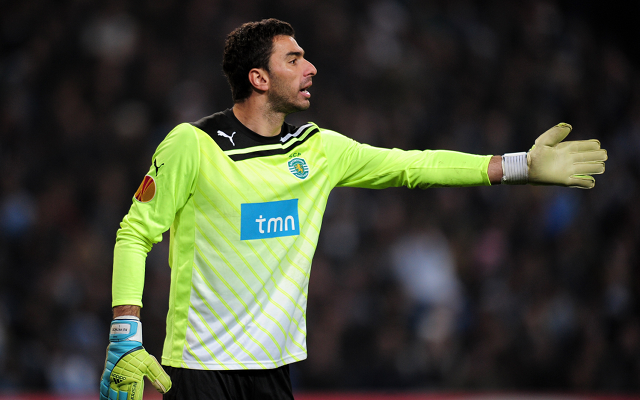 Liverpool can reportedly land Sporting Lisbon goalkeeper Rui Patricio for a fraction of his buy-out clause this summer. Earlier this month, O Jogo reported that Sporting valued the Portugal shot-stopper at €40 million (approximately £28.6m), which is his minimum fee release clause. However, more recent reports from the same publication suggest the Primeira Liga outfit are now willing to lower their demands in the wake of Liverpool’s interest. That would be a drastic about-turn, which could see the 27-year-old head to Merseyside for a fee in the region of €10 million (around £7.1m). The Reds face competition for the Portugal international from Bundesliga side Borussia Dortmund, but O Jogo suggest head coach Jurgen Klopp’s decision to leave at the end of the season could hinder the Germans’ attempts to secure Patricio’s signature. The shot-stopper, who has spent his entire professional career at Sporting, has earned 36 caps for his national side, for whom he is first-choice between the posts. He has been an ever present at club level this season, making 37 appearances in all competitions. Sporting sit in third place in the table, with Patricio conceding just 26 goals in 29 top-flight outings and keeping ten clean sheets. On paper, it’s an impressive record, but the standard of the league can certainly be called into question. To illustrate that point, leaders Porto and second-placed Benfica have allowed just 15 and 12 goals respectively in the same amount of games, while SC Braga in fourth too have only let in 18 goals. Liverpool’s current number one, Simon Mignolet, has improved in the second half of the campaign after being dropped in January, following a number of high-profile blunders. Patricio boasts an excellent presence on his line, and claims crosses well. However, he can appear uncomfortable with the ball at his feet, and his decision making can be questionable – he’s often been seen haring out of his box to reach the ball before a striker, and hasn’t always proved successful. Those are very similar strengths and weaknesses to Simon Mignolet, suggesting that if a deal goes through, a real battle to be Liverpool’s number one next season could be on the cards. Liverpool’s rivals Chelsea, Arsenal, Manchester United and Man City all have two international goalkeepers competing for the position, but while Brad Jones has four caps for Australia, it’s fair to say he’s not of the same calibre as Petr Cech, Wojciech Szczesny, Victor Valdes or Willy Caballero. Reds boss Brendan Rodgers will undoubtedly be aware of that discrepancy between his team and their competitors, and that may explain the reported interest in Patricio.